These tapes are designed for your convenience for your LetraTAG model. Use them to organise your office, filing, kitchen or home in a variety of styles that adhere to a range of surfaces, in a rainbow of eye-catching colours. BEST SELLER. Black print on a White plastic tape for use with DYMO LetraTAG label makers. 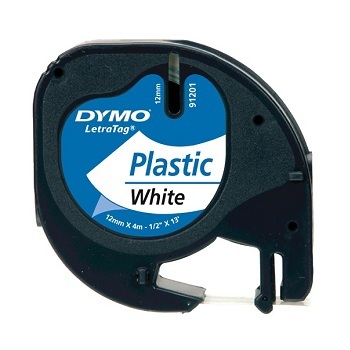 DYMO LetraTAG label tape cassette 12 mm x 4 metres. Black print on a White paper tape for use with DYMO LetraTAG label makers. 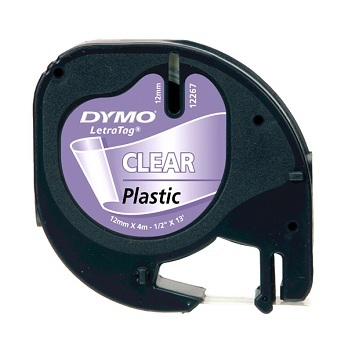 Value Pack of 2 x DYMO LetraTAG label tape cassettes 12 mm x 4 metres. Mixed Starter pack of 3 tapes for use with DYMO LetraTAG label makers. Black print on a Yellow plastic tape for use with DYMO LetraTAG label makers. Black print on a Red plastic tape for use with DYMO LetraTAG label makers. Black print on a Green plastic tape for use with DYMO LetraTAG label makers. Black print on a Blue plastic tape for use with DYMO LetraTAG label makers. Black print on a Metallic Silver plastic tape for use with DYMO LetraTAG label makers. Black print on a Clear (Transparent) plastic tape for use with DYMO LetraTAG label makers. 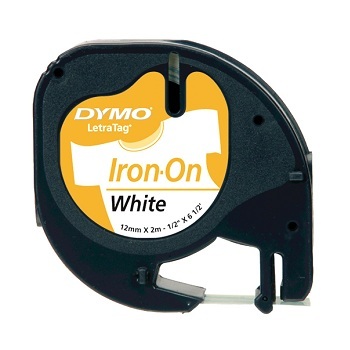 Black print on a Iron On fabric white tape for use with DYMO LetraTAG label makers.